Doctors are finding that a large percentage of autistic children have an MTHFR genetic mutation. The MTHFR gene is important for utilizing folate and turning it into Glutathione, which is one of the body’s chief antioxidants. Because it is used in many processes in the body, a glutathione deficiency can negatively impact every system in the body. Most importantly, if the body does not make enough, it can not detoxify the many chemicals that we come into contact with every day. Those with an MTHFR mutation cannot utilize the synthetic folic acid found in vitamins or fortified in breads, pastas, cereals etc. In fact, folic acid can be dangerous as it blocks the receptor sites from utilizing the true form of folate. An MTHFR mutation can result in many conditions, such as high cholesterol, stroke, bi-polar disorder, irritable bowel syndrome, type 1 diabetes, Alzheimer’s, MS, asthma, frequent miscarriages and much more. The mutation is most often treated with the active form of folate (methylfolate), B-vitamins, and the avoidance of synthetic folic acid. Testing for the MTHFR mutation can be done by any doctor, typically through a blood draw. You can also test yourself, with a saliva sample, through 23andme.com or AncestryDNA.com. To collect saliva from a child who cannot spit, utilize a special sponge to swab the mouth. You will want to find a method to squeeze the sponge into the saliva collection bottle, being careful not to actually touch the sponge with your fingers. It was very easy, and I was able to do it on all 3 of my children. These companies will make your uninterpreted raw genetic data available to you on their website after 5-6 weeks, which you can upload to Genetic Genie, Livewello or MTHFR Support for a fee. Each site provides you with detailed instructions on how to go about this. These companies can interpret your results and provide a detailed report of your mutations. A sample report can be found here. Once you receive the results of your genetic data, you may be overwhelmed and have a lot of questions. A lot can be answered in Dr. Amy Yasko’s free online book called Pathways to Recovery. Promethease – Literature retrieval system that builds a personal DNA report based on the scientific literature. The Heartfixer website is another great resource for more information and better understanding. 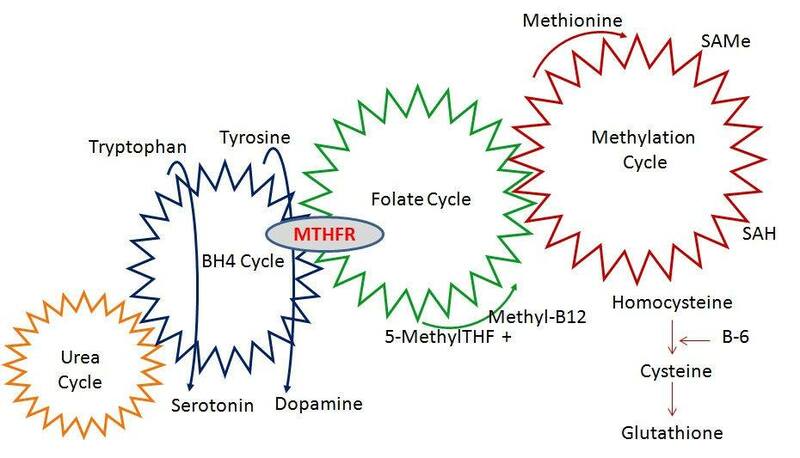 Here is a diagram of the methylation pathways. A much more detailed version can be found on the Heartfixer website. As mentioned previously, the MTHFR mutation is most often treated with the active form of folate (L-methylfolate), B-vitamins, and the avoidance of synthetic folic acid. Dr. Ben Lynch provides a basic protocol on the MTHFR website. There are many different forms of folate in various supplements, as listed below. Please read this article to determine what may be right for you. When starting any supplement, it is wise to start with a low dose and slowly increase amounts depending upon your body’s reaction. Too much folate can cause side effects such as muscle cramping, headaches, nausea and more. You can also be tested to determine the dosage that your body may need. Here is a list of children’s multi-vitamins, which contain the active form of folate. Facebook has a great support group called MTHFR Gene Mutation. The group is open for anyone to join and learn. There are literally dozens of studies and articles coming out about how an MTHFR mutation can affect different processes in the body. I will provide some links of interest below. If you have not already, please log into 23andMe and go to the following link, to download your raw data.